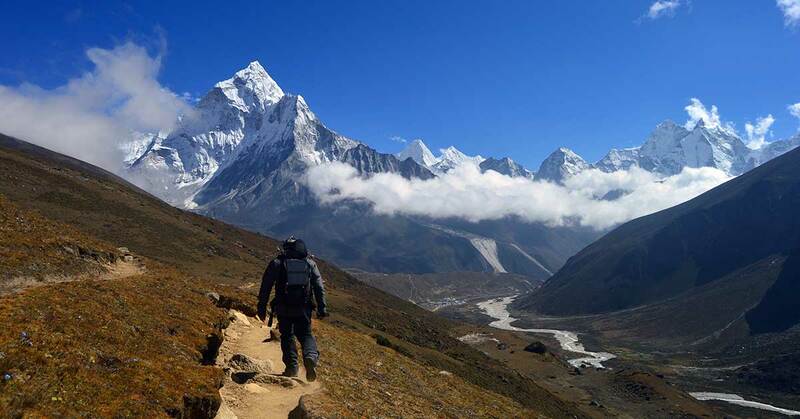 Trekking to Everest Base Camp is definitely an epic journey. And it becomes even more marvelous when an additional wonderful trekking section to Gokyo and Cho La is added to it. 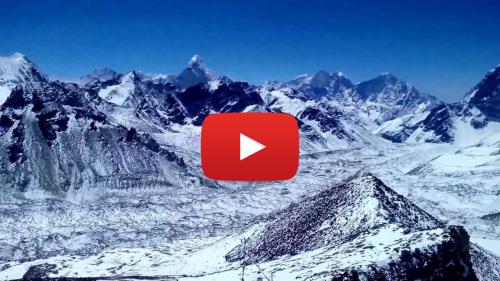 Yes, definitely, Everest Base Camp Trekking via Gokyo Lakes and Cho La pass is a grand epic Himalayan journey. 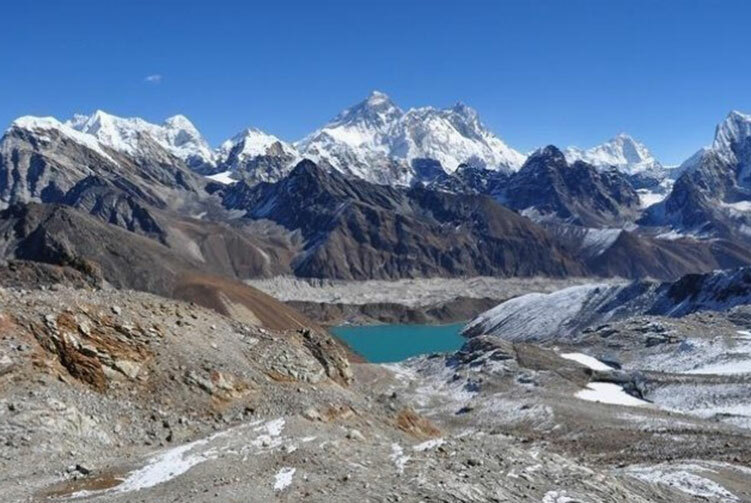 The trekking journey goes to explore the charismatic charm of the Gokyo region and the lakes, glacier and mountain views before proceeding towards the Everest Base Camp. The pristine lakes at Gokyo, challenging hiking to Gokyo Ri, tough yet rewarding walk over Cho La pass, joy of being at the base of the highest mountain in the world, panoramic mountain views with incredible sunrise from Kalapatthar, Sherpa culture and spiritual riches and much more make this trip wonderful beyond explanation. Enjoy being at the one of the most spectacular places on earth and take lovely memories back to cherish. Enjoy your breakfast at the hotel. We come to take your for a wonderful cultural heritage tour of Kathmandu valley. As part of the tour, we are going to visit four of the UNESCO Heritage monuments in Kathmandu valley. The places we visit today are incredible mixture of culture, history, spirituality, art and stories. After spending an acclimatizing day at Namche Bazar, we are ready to move ahead on our journey. We head towards Gokyo valley on our trek today. 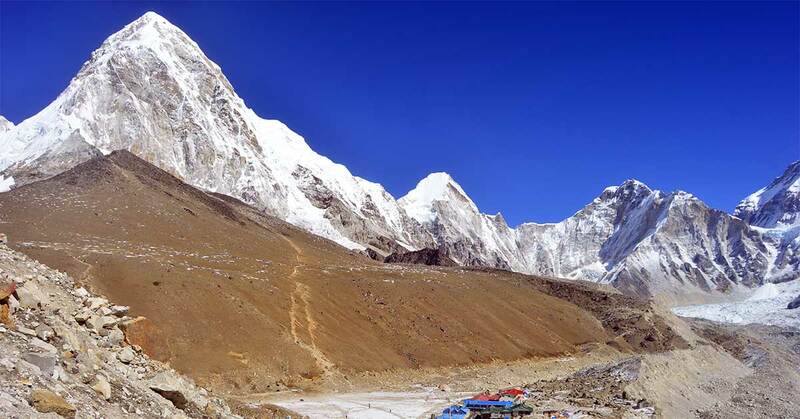 Before the Everest Base Camp, we are going to explore Gokyo valley. Thus, we are trekking to Dole today. Dole is a small and beautiful village where the serenity and good vibrations prevail in abundance. As soon as we start walking on the route to Dole, we feel the difference, in terms of number of trekkers. 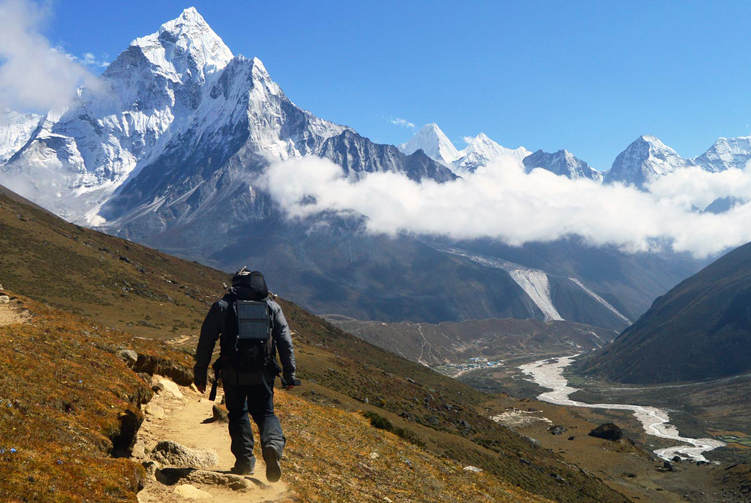 The region has fewer trekkers than on the Everest Base Camp trekking trail. We enjoy this incredibly peaceful atmosphere in the region. Overnight at a lodge. We trek to Machhermo today. As we go higher, we feel the change in the vegetation, landscape and oxygen level. The thinning oxygen level creates a little bit challenge but, with the excitement and strong determination, we can overcome this challenge. After all there are a lot of such challenges that we are going to face during our adventure journey. The challenge of the walk becomes easier as we can enjoy some unearthly views during the walk. Eventually we reach Machhermo, just below the Ngozumpa glacier, to stay overnight. Overnight at a lodge. 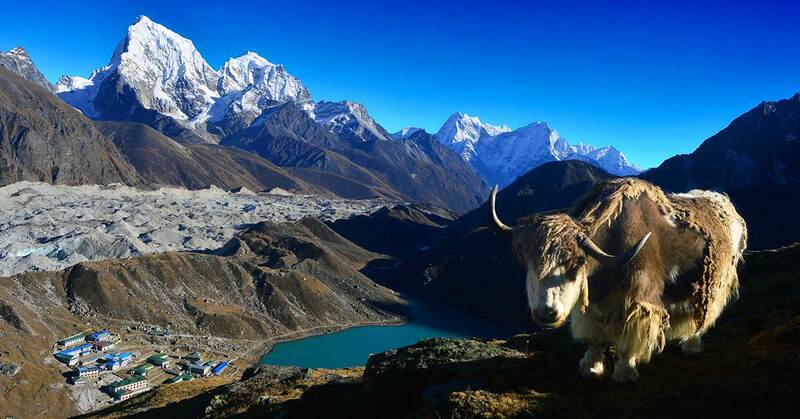 We are going to reach the region where beautiful Gokyo lakes are located. 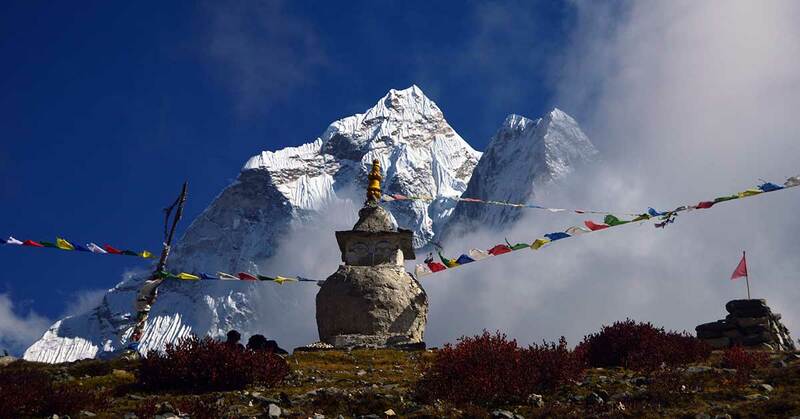 We begin the day with an ascent with the views of beautiful mountain peaks of Cho Oyu and Kangtenga. The trail traversing between Machhermo and Gokyo takes us via two beautiful lakes, Longponga - the first lake and Taujun - the second lake. We also come across an ancient cave called Nilbuk along the trail. We reach on the shore of Dudhpokhari, the third of five lakes in the region, to stay overnight. Overnight at a lodge. 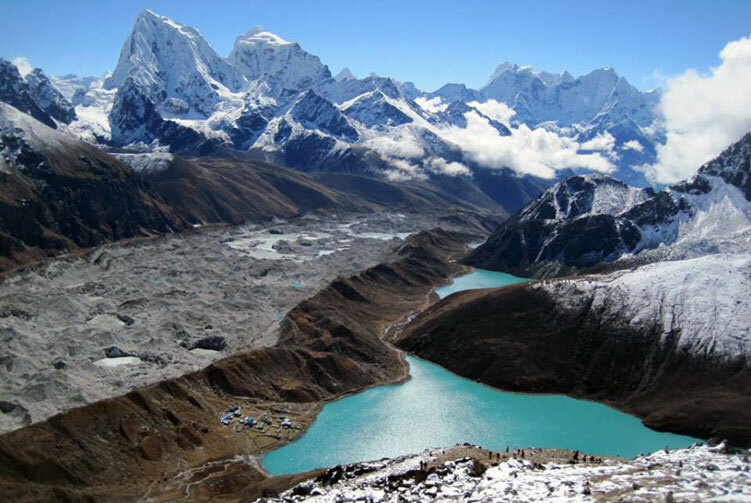 Making Dudhpokhari our base, we are going to hike up to a fabulous view point called Gokyo Ri today. It's challenging yet equally rewarding hike to the Ri. Although the hiking part is pretty much challenging, we feel a great relief and joy when we reach the top. 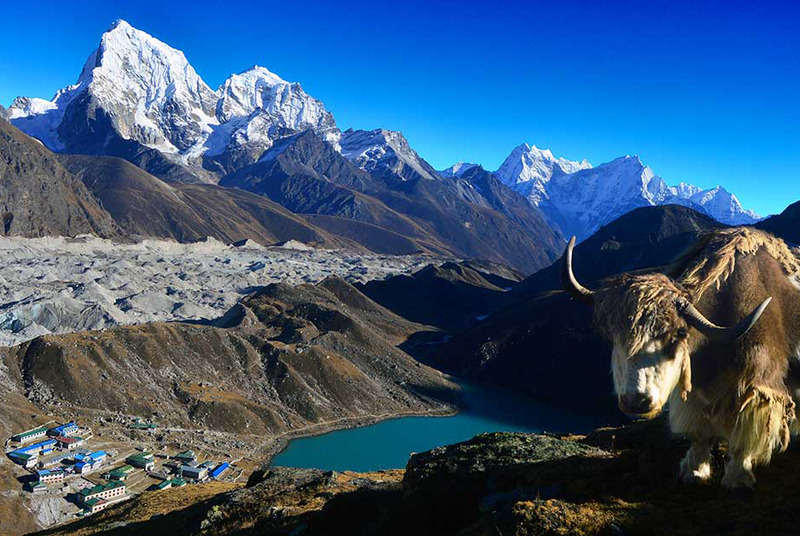 Gokyo Ri provides a breathtaking view of the mountain peaks in the region including the 8,000 meters mountains - Everest, Lhotse, Cho Oyu and Makalu. Apart from the mountains, the peak also provides overwhelming views of the lakes, glacier and surrounding wonders. Later, we descend to the lodge and spend leisurely time around the lake. We can explore more about and around the lake while we enjoy the magical charm that the place has. Overnight at a lodge. We trek to Thagnak today. After spending a wonderful day at Gokyo and hiking to Gokyo Ri, we walk on easy pace on easy trail, easy for the high altitude trail. We walk along the glacial path towards the destination and reach there early in the afternoon. We will have enough time to explore around Thagnak after lunch. On our walk to Dzongla today, we are going to walk over a high mountain pass called Cho La. Cho La pass, at the elevation of 5,420 meters above sea level, provides a marvelous view of the mountains. But the breathtaking view is rewarded only after a strenuous uphill walking effort from Thagnak. The trail is quite tricky one and sometimes, if there is too much ice on it, we need to use our climbing skills although not highly technical. But the view from the pass makes us forget all the challenges we go through to reach there though for a moment. We carefully descend to Dzongla after enjoying the view from the pass. Overnight at a lodge. 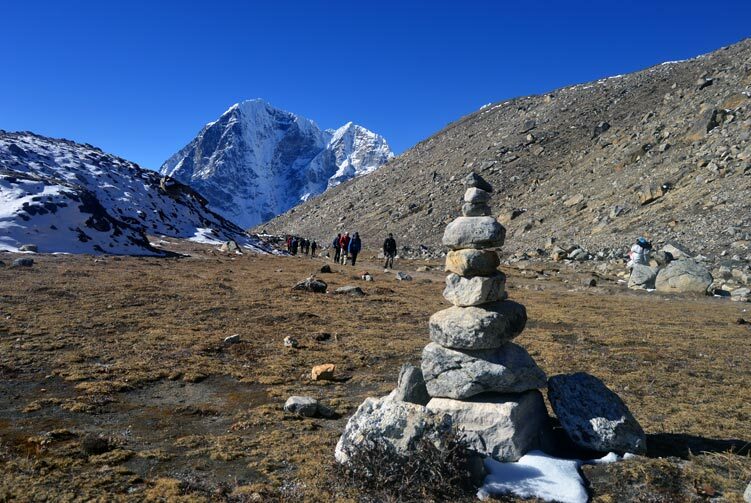 Our walk today takes us to meet the trekkers to Everest Base Camp on the regular route. 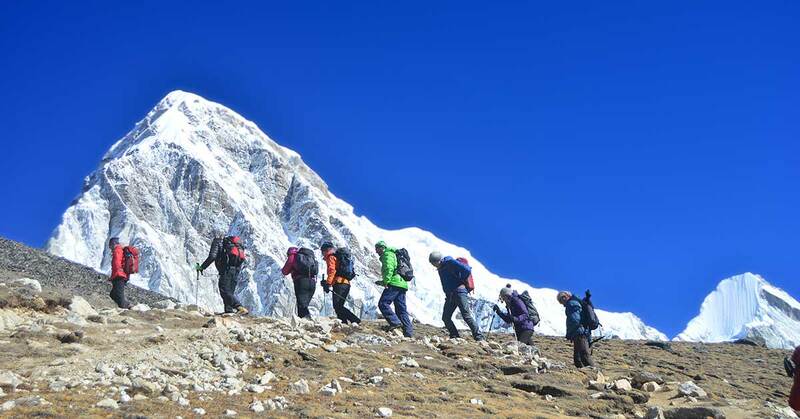 When we reach Lobuche today, we join the trekkers who took the normal EBC trekking route up from Namche Bazar. 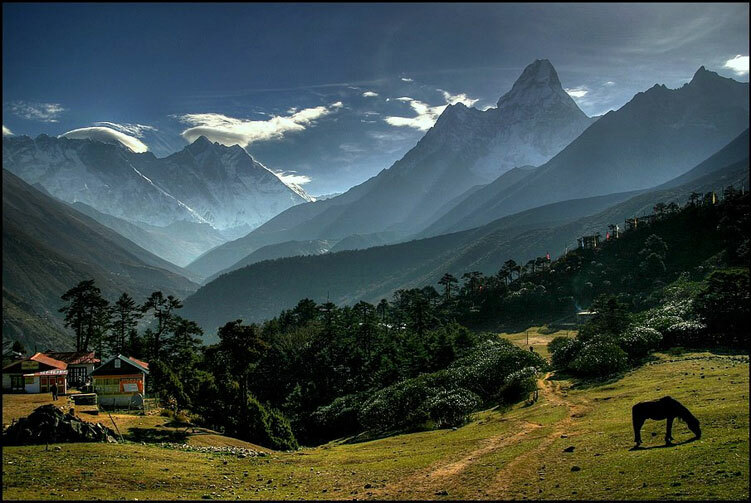 The trekking from Dzongla to Lobuche is a beautiful and short walk with the views of the mountains to keep our motivation high. We reach Lobuche little early allowing ourselves time to explore around. Overnight at a lodge. Today is the day when we make it to the destination of this epic journey. We trek to the Everest base camp via Gorakshep after stopping for the lunch there. Gorakshep serves as our overnight site for the day. After checking in the lodge at Gorakshep, we set off on the journey to the epic Everest base camp. The trail to the base of the highest mountain in the world is full of glacial moraine and boulders. We reach the base camp and spend some wonderful time there taking pictures and absorbing the mountain vibes. We, later, walk back to Gorakshep to stay overnight. We watch the sun rise beautifully over the magnificent mountains; take picture of the mountains and the sunrise and, later on, return back to lodge at Gorakshep for breakfast. Hungrily devouring the breakfast, we fill up ourselves with much needed energy to go back. We are trekking back to Pheriche today. Overnight at a lodge. We trek back to Namche bazar today. 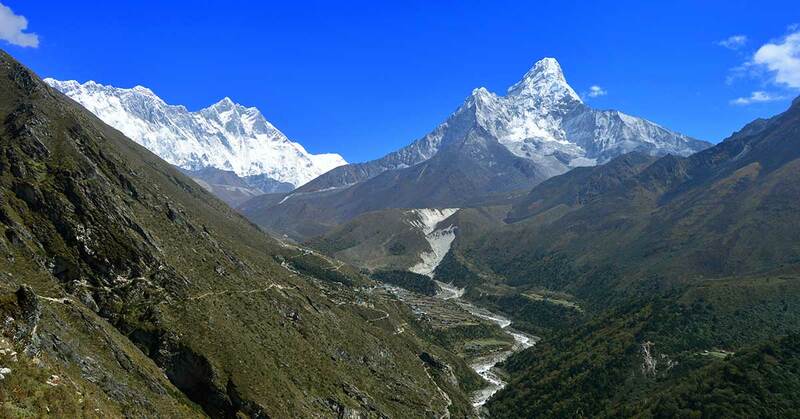 The route we take goes via Tengboche where we will visit the monastery there. Later we descend to a river and cross it to go an uphill section. Later we follow a gradual downhill trail taking us to Namche Bazar. We can stay relaxed at the comfort of the lodge or go for a wandering around in Namche Bazar. Overnight at a lodge. The final day of this trek is eventually here today. We walk back to Lukla via Monjo and Phakding along the Dudh Koshi River. A round trip on the Three High Pass Trekking trail comes to end here. We celebrate the end of the trekking part of the journey and thank our wonderfully amazing supporting crew members for their service and effort to take us to the base camp and back safely. Overnight at a lodge. We get ready for the flight back to Kathmandu. We board the plane at Lukla airstrip and fly back to Kathmandu. Once we land in Kathmandu airport, we go to hotel and spend the whole day at leisure on our own. Finding relieving massage, good food, souvenir shopping, and wandering around can keep you busy for the day. A farewell dinner is scheduled for this evening. We will let you know the departure time for dinner once we reach Kathmandu. Welcome and Farewell dinner with cultural program. 4 Nights Tourist Standard Hotel Accmmodation in Kathmandu with B/B basis. Half day guided city tour with entrance permit. Round Flight ticket for Kathmandu-Lukla-Kathmandu with airport TAX. Professional & highly expertise government licensed holder Trekking Guide. 2:1 Porters to carry luggages. 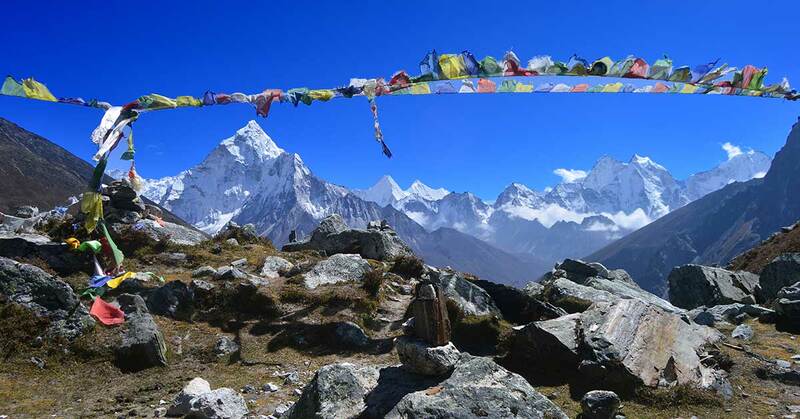 We offer you the best price guaranteed for Everest Base Camp Trek via Gokyo Lakes.